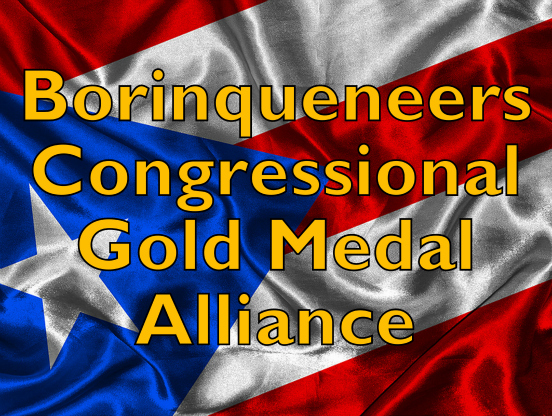 At Borinqueneers Congressional Gold Medal Alliance, our historic efforts are dedicated to our Borinqueneer heroes, and to all Latino-American veterans who have served & sacrificed in the cause of freedom. We salute them all! 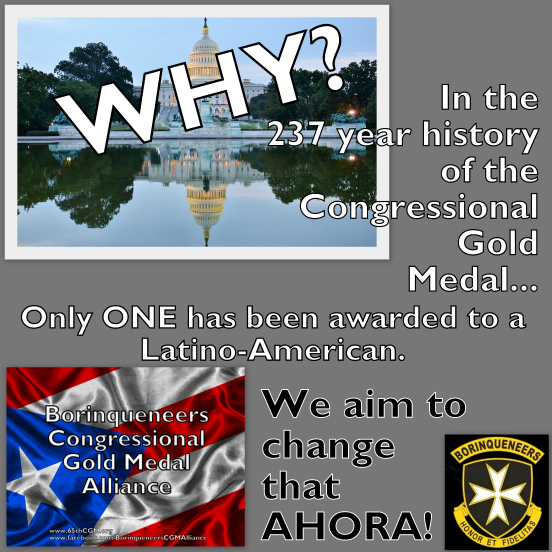 You can use the button below to contact us to suggest a Latino-American hero to add to this page. 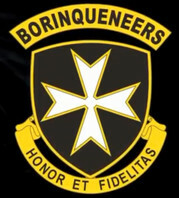 HONOR ET FIDELITAS [Honor and Fidelity (Faithfulness)], the motto of the 65th Inf. Reg. 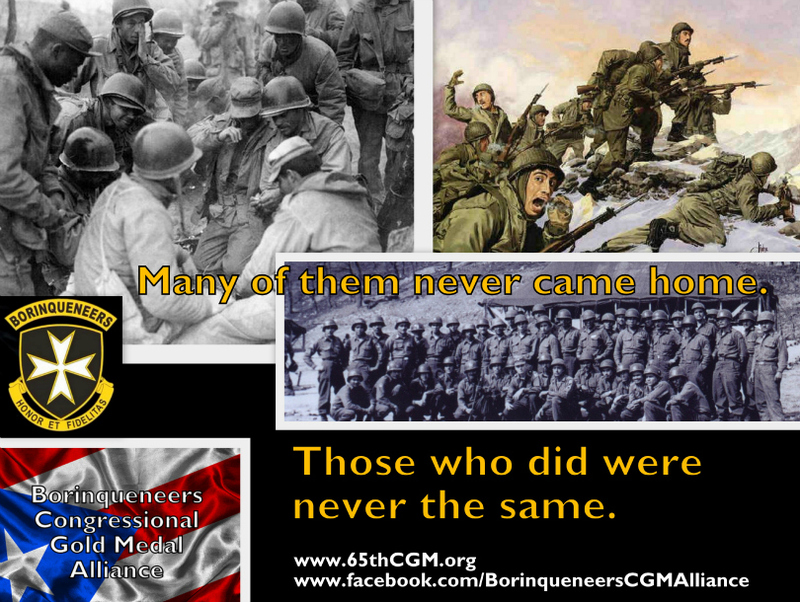 Borinqueneers who hailed from Puerto Rico, & who served the cause of freedom with distinction & heroism from 1899 through the Korean War, all the while suffering the additional hurdles of segregation & prejudice, which did not deter them. 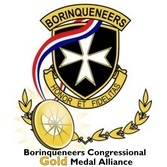 Their souls, both of the handful of living heroes and the thousands of honored dead, reach out to us, the volunteers and supporters of the Borinqueneers Congressional Gold Medal Alliance, and to all like-minded men & women of goodwill. 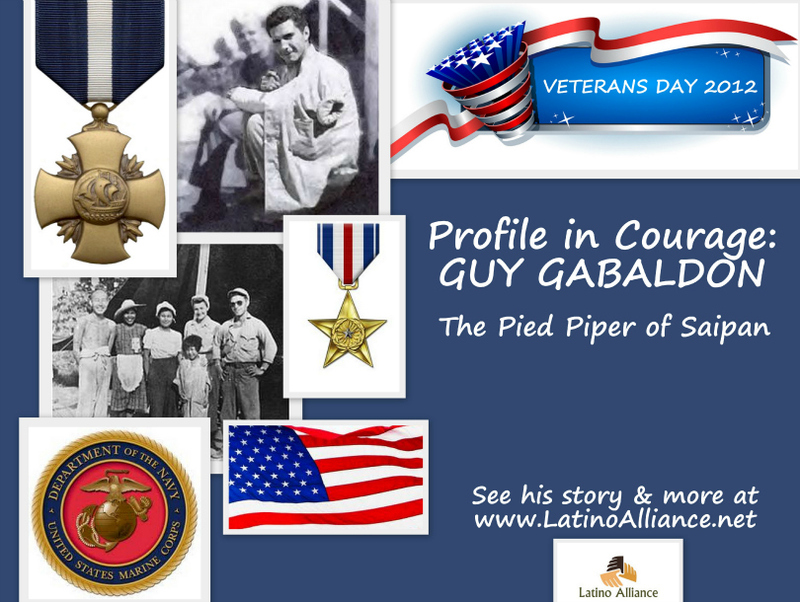 We include all Latino-American veterans who have served and sacrificed in the cause of freedom. They, too, are remembered and honored. Our historic efforts are dedicated to them as well, and we salute them with the eternal gratitude that is underscored by the statement, "Freedom is NOT free." On this page is just a small sampling of those who we hold high. 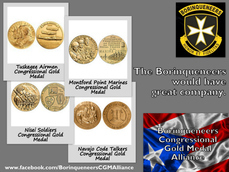 He was awarded his 1st Distinguished Service Cross, 1st Silver Star, & 1st Purple Heart while serving as a 65th Inf. Reg. Borinqueneer in Korea. A Mexican-American, Richard Cavazos was born in Texas and excelled in the ROTC program while attending college at Texas Tech. 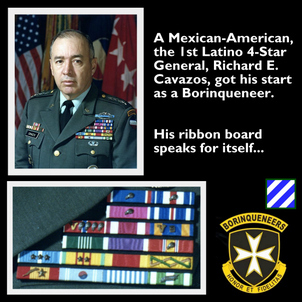 His first Army combat assignment was as a young Borinqueneer officer in Korea. There, he earned the admiration and respect of the Puerto Rican soldiers, and became known as a true soldiers' officer. 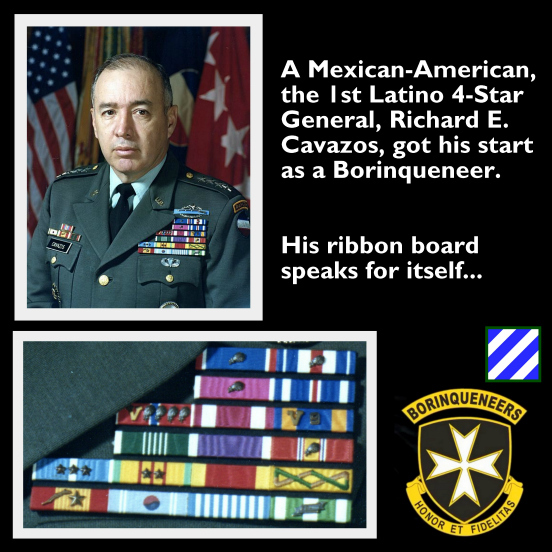 See our Historia page for more on Gen. Cavazos, including his Borinqueneer Distinguished Service Cross citation. "In his parent's home, on his bedroom walls hung only three items - a copy of the United States Constitution, the Bill of Rights and his boot camp graduation certificate." Before he set out for Fallujah, he wrote to his 14-year old brother, "be proud of me, bro...and be proud of being an American." Rafael Peralta was born on April 7, 1979 in Mexico City. Son of Rafael and Rosa Peralta, the oldest of four, with siblings Icelda, Karen and Ricardo, he immigrated to the United States, graduated from Morse High School in 1997, and joined the United States Marine Corps as soon as he had a green card in 2000. He later became an American citizen while serving in the Marine Corps. On November 15, 2004, 25 year old Sgt. Peralta, deployed to Iraq as a scout team leader assigned to Company A, 1st Battalion, 3rd Marine Regiment, along with his team was ordered to clear houses in the Operation Phantom Fury. Peralta was not assigned to enter the buildings, but chose to do so anyway. Sergeant Peralta led his team through a series of house clearings before charging into the fourth house. He found two rooms empty on the ground floor. Peralta opened a third door and was hit multiple times with AK-47 fire, leaving him severely wounded. He dropped to the floor and moved aside in order to allow the Marines behind him to return fire. The insurgents responded by throwing a grenade at the Marines. The two Marines with Sgt. Peralta tried to get out of the room but could not. Sgt. 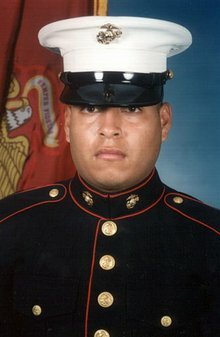 Peralta was still conscious on the floor and reports indicate that despite his wounds, he was able to reach for the grenade and pull it under his body absorbing the majority of the lethal blast and shrapnel which killed him instantly, but saved the lives of his fellow Marines. He received the Navy Cross posthumously in 2008. His comrades, family, veterans, and many others have also supported the cause that Sgt. Peralta be awarded with the Congressional Medal of Honor. We hope so, too. NOW! AHORA! We hold high all military men & women who gave their lives in the line of duty, serving their country in the cause of freedom. The daughter of Mexican immigrants, Army Sgt. 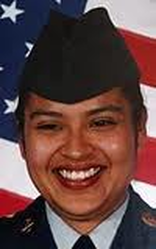 Isela Rubalcava, died in combat while serving in the war in Iraq in 2004. She joined a long list of Latinos and other Americans who, before her and after her, served and sacrificed for their precious country and its people. We salute them all, and pledge not to take for granted their legacy and the liberties and opportunities that they sought to protect! See Fox News Latino story on Sgt. Rubalcava from Memorial Day 2012: click here for story. An accomplished combat sky diver, he left the Golden Knights parachute team after the 9/11 terrorist attacks to return to combat duty. 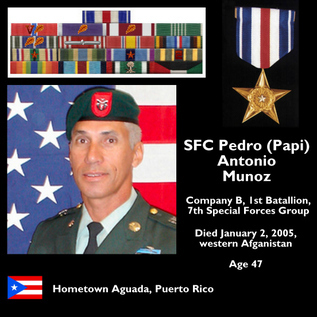 Sergeant First Class Pedro A. Munoz Yambo, United States Army, was awarded the Silver Star (Posthumously) for conspicuous gallantry and intrepidity in action against the enemy while serving as Operations and Intelligence Sergeant assigned to 1st Battalion, 7th Special Forces Group, while conducting an offensive operation in Shindand, Afghanistan, on 2 January 2005. On that date, while in pursuit of a mid-level Taliban commander, Sergeant Munoz entered a room filled with women and children, when an enemy fighter opened fire on him. In spite of his wounds, Sergeant Munoz returned fire and killed his assailant without harming anyone else. His dedication and his courage are evident through his actions: protecting innocent life, staying in the fight without thought for himself while supporting his teammates, allowing them to successfully accomplish their mission. 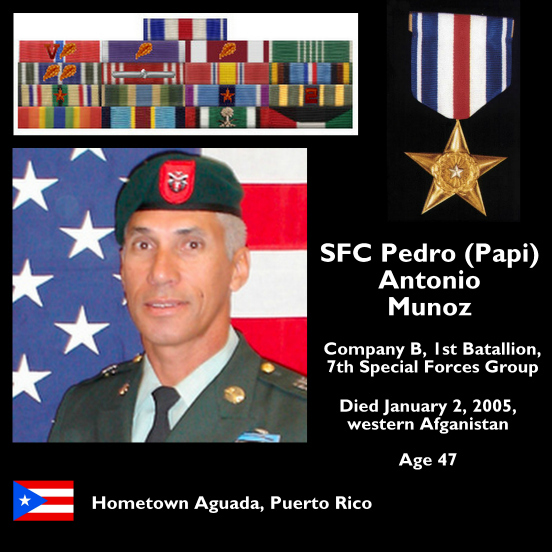 Sergeant First Class Munoz's gallant actions and dedicated devotion to duty, without regard for his own life, were in keeping with the highest traditions of military service and reflect great credit upon himself, his unit, and the United States Army. See archived U.S. News & World Report story to learn more about "Papi". 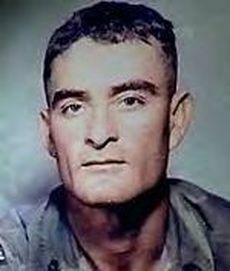 Master Sergeant Raul (Roy) Perez Benavidez (August 5, 1935 – November 29, 1998) was a member of the Studies and Observations Group of the United States Army. He received the Medal of Honor for his heroic and unparalleled actions in combat near Lộc Ninh, South Vietnam on May 2, 1968. 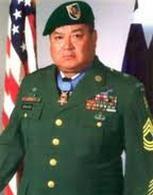 Please see the excellent Wikipedia article on MSG Benavidez by clicking here. We also highly recommend the YouTube video below. See our Historia page for more on Don Modesto, including his Distinguished Service Cross citation. 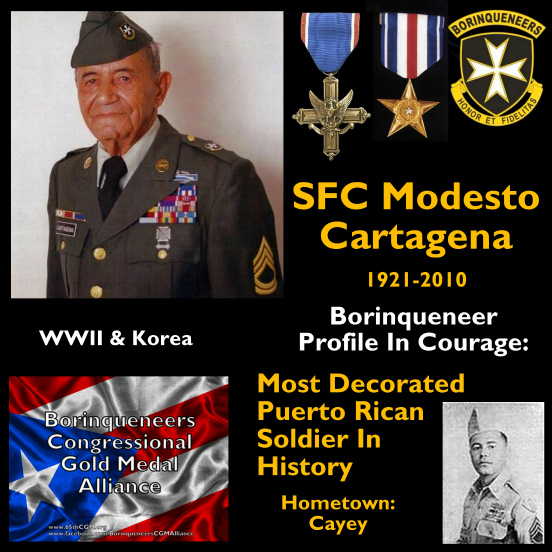 Jorge Otero Barreto was born in Vega Baja, Puerto Rico, and joined the US Army in 1959. After graduating from the Army's Air Assault School in 1960, he served in Southeast Asia for five tours of duty in the war in Vietnam from 1961 to 1970. 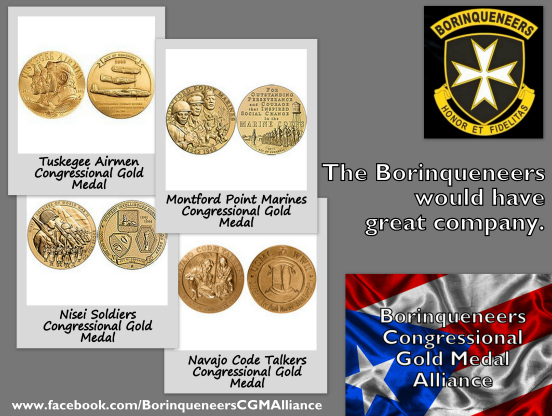 Jorge participated in 200 combat missions and earned 38 military decorations that made him the most decorated US military member of the war in Vietnam. His decorations include 3 Silver Stars, 3 Bronze Stars, 5 Purple Hearts, and 5 Air Medals. A transitional home for homeless veterans in Springfield, MA, was named in his honor by the Bilingual Veterans Outreach Centers of Mass., a national partner of our alliance. 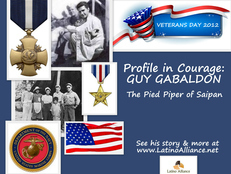 Click on Guy Gabaldon visual to enlarge. The heroic efforts of this Mexican-American US Marine are chronicled by alliance member Tony "The Marine" Santiago on our partner's website. Read the story now.